Sweet and tangy Meyer Lemon soft baked cookies with topped with a slightly sweet and tangy frosting. I love a really good sugar cookie especially a soft one with a thick layer of frosting. The frosting might be my favorite part of it. The soft sugar cookie has to be my favorite that you can buy from a store. I can eat maybe three to four of them in one sitting. If you haven't heard of Meyer Lemons they are thought to be a cross between a lemon and mandarin. They can have a slight orange hue to very orange hue and can be the shape of a lemon or an orange and they are not as tart as a lemon. 1. Zest lemons into sugar and let it set for 30 minutes. 2. In a medium size bowl, combine flour, baking powder and sea salt. Set aside. In a large bowl, cream together butter and lemon sugar until light and fluffy, about 3 to 5 minutes. 3. Add sour cream, vanilla, lemon juice and eggs one at a time. Mix for 1 to 2 minutes. Lower the speed of your mixer, slowly add in flour mixture. 4. Cover and chill for 3 to 4 hours. 5. Preheat oven to 325 degrees and cover cookie sheet with parchment. Scoop 1/4 cup worth of cookie dough roll it then flatten to 1/2 inch thick. If the dough is sticky you may have to roll in a little of flour. Bake for 10 to 12 minutes until slightly set in the middle. 6. Let the cookies cool on the sheet for 5 minutes then transfer to a wired rack until fully cooled. 7. For frosting: cream together butter until light and fluffy. Add confectioners' sugar at a 1/2 cup at a time. Add Meyer lemon zest, Meyer lemon juice and pinch of salt. Spread frosting over cookies and let set for 30 minutes before enjoying or storing into an airtight container. Note: Can substitute regular lemons and Mandarin oranges or naval oranges if you can't find Meyer Lemons. Yum, I love soft sugar cookies! I've never tried baking with Meyer lemons but I'm dying to try them. Mmmmm these look so delicious! I actually really love lemon as a flavor, which is a recent development. And lemon mixed with something super sweet (like a sugar cookie!) is so good to me. I may just have to bake these! You always share the best recipes! I love the flavor combinations. These cookies look tasty! I have never heard of Meyer Lemons and today I learn it. I always love some taste of lemon mandarin in my desert or cookies. Now, I know how to make it. Thinking of it already make me mouth watering. I should make these one fine day! Looks so good! I am craving sugar cookie right now after seeing those pictures. Will be hard to resist. Arent these just amazing looking!!! I love the tangy taste of lemon. I love all your sweet combinations like salty and sweet and now this one! The frosting does look amazingly tasty!! Oh my, these look so delicious! Perfect timing as I need to bring some baked goodies to my daughter's school fundraiser so I will be trying this receipe. Thanks for sharing! Oh these sound just amazing! I love sugar cookies and lemon so if I ever get the patience to bake again I will definitely try out this recipe! I'm not a lemon fan but these look delicious! And most people love lemon, so this is a good one to try for parties! These look soooooo good! Love the lemon zest decoration on the top. Makes the cookies look super-cute! This looks so mouth-watering - can't wait to try it out! These look so yummy!! Thank you for sharing! These look dangerously good! They're going on the list for this weekend for sure –– I love sugar cookies and I LOVE lemon. These look so delicious! 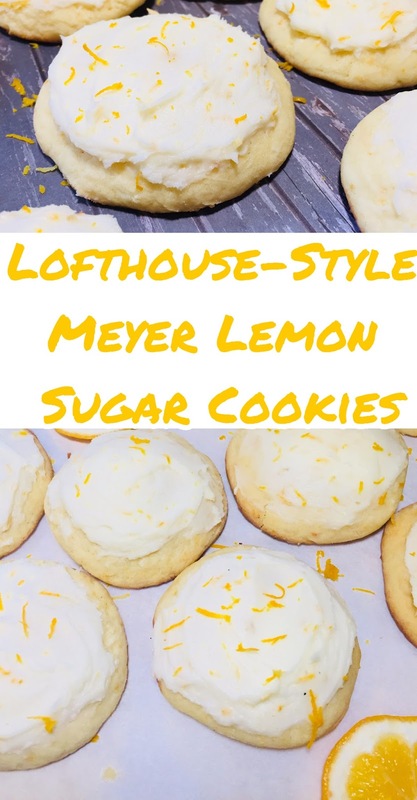 My family is in love with Loft Style Cookies and Meyer Lemon is the best! I will have to make some of these this week! This looks so delish! I'm going to have to try your recipe and make this with my kids. Thanks for sharing. Lucy I am with you I love a soft sugar cookie! I also love a thing lemon too! This post really speaks directly to me, these would be perfect for Easter! Defiantly. I always try to use the real thing instead of candied. We love sugar cookies, but this is an interesting twist. We'll have to try it this weekend. These made my cheeks water. I love lemony desserts. Yummy! I love lemon anything!! These look amazing and my husband loves lemon dessert of any kind. Saving this recipe for sure! These look incredibly delicious! Thank you for sharing! I absolutely love the sound of that frosting! My mom grows lemons on her trees and is always looking for lemon dessert recipes. These look amazing! I am definitely going to try them along with some of your other recipes! These are my favorite type of cookies and I absolutely LOVE lemon! I will definitely be making these. Oh my! These would be soo good right about now! I need to try making these lemon sugar cookies. wow,wow this looks so delicious.I envy you right now,how i wish i could make such .Will bookmark this and try it later. Yum! I'm a big fan of soft cookies! These lemon sugar cookies sound like the perfect way to bring a little sunshine into these cold days we're having. I love anything lemon, these look and sound delicious! Drooling while reading... Didn't know that was possible! These look divine. I love the punch lemon packs in baking. Can't wait to try these out. Love tangy sweetness of lemon flavoured anything! Pinning this to try later. Mouth watering, fingers shaking as I am so hungry for these .... these look delicious! All your cookies always look sooooo good!! These sugar cookies look so delicious. I would love to make them. Thanks for sharing. Oooo these are right up my alley!! And they’re soft bake?! Yes!! I love lemon sugar cookies and these Lofthouse-Style Meyer Lemon Sugar Cookies look so delicious. I am loving the frosting and presentation also. I would love to try these out. Oh my good gracious, I absolutely love lemon cookies, they are my favorite. What I love about this post is the fact that these cookies have frosting on them and look incredibly fresh! I've never tried a lemon like this before. The cookies look so good and they're perfect with your afternoon tea! I'd love to give it a try. This seems absolutely delicious! Going to try the cookies this evening I think! I love a good sugar cookie. I just made some last week for valentine's day. I've never used sour cream in a cookie recipe, I'd be interested to see how these come out. Looks great. I can almost taste the tarty lemon and the sweet cream just by the pictures you have taken. Looks like another great recipe Luci. Thanks! Easy instructions and ingredients, I think I'll have these for the weekend. I haven't heard about Meyer Lemons before, I like the sound of that cross breed! I’ll be honest, not all lemon desserts are created equal and these look tip-top! I’ll have to make these when my MIL comes to visit, as lemon is her favorite! these look quite flavorful and energizing, i LOVE meyer lemons! Oh yum, can't wait to make a batch of these! Love lemon! Lemon desserts are my favorite. I never make them though. This recipe looks tasty specifically for the lemon flavor, lol but lemon cookies are definitely underived appreciated too. How I love cookies with lemon flavor, I think that's really kinda bizarre though cause I never found this kind of cookies in any of the supermarkets. I have seen som cookies with orange but never with lemon. They look so delicious! Can't wait to taste them! I am making these this weekend, my daughter and her partner will be arriving Sunday evening to stay for a week :). These look deliciously yummy! I want to try this out! These look so yummy! I love the idea of lemon zest on top! Looks yummy! Instead of lemon can I use orange or other citrus family? You defiantly can use any citrus that you like. Yumm cookies again. Love the tangy twist to this. I love Meyer Lemon and a good sugar cookie. All these flavors sound amazing! I love the idea using lemon on sugar cookies, it balance the sweet and tangy taste!